A native to the Southwest and Mexico. 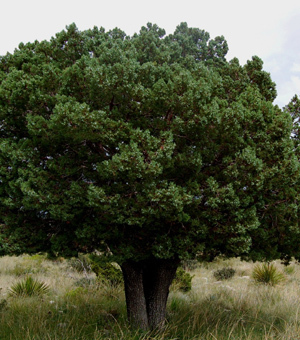 The largest and oldest juniper in the southwest, it has blue-gray foliage with an upright growth habit. The checkered black to gray-black bark is very distinctive. It is broken into a series of rectangular to square plates, resembling alligator hide. The male trees have tiny yellowish cones; females produce berries that are 1/2" in diameter. Fast growth rate. It is valued for the picturesque habit and distinctive bark. An easy, native evergreen tree.